I. de La Rochenoire, by 1875. Alexandre Dumas [1824-1895]; (his sale, Hôtel Drouot, Paris, 16 February 1882, no. 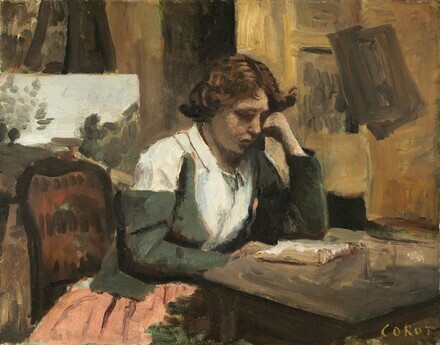 13, as La Lecture, figure). (Dumas sale, Hôtel Drouot, Paris, 12-13 May 1892, no. 22). (Dumas sale, Galerie Georges Petit, Paris, 2-3 March 1896, no. 12). Gaillard collection, by 1905. Ferdinand Blumenthal [d. 1914], Paris;  his son Count Cecil Pecci-Blunt [d. 1965], Paris, until at least 1946. (Wildenstein & Co., New York); sold 27 January 1960 to Paul Mellon, Upperville, Virginia; gift 1985 to NGA. Lent by I. de la Rochenoire to Exposition de l'oeuvre de Corot, Ecole Nationale des Beaux-Arts, Paris, 1875, no. 135. According to an annotated copy of sale catalogue in the M. Knoedler library, the painting was purchased by Durand-Ruel et Cie, Paris. If, however, this is true, it is unclear how the painting came to be included in the Dumas estate sale in 1896. Alfred Robaut, L'oeuvre de Corot, Paris, 1905: III:116, no. 1570, listed the Gaillard collection in the provenance. According to Wildenstein and Co. précis, dated 27 January 1960, in NGA curatorial files. Pecci-Blunt had the painting on consignment with Jacques Seligmann in 1941 but decided not to sell his collection at that time. Receipt for the return of the paintings to Pecci-Blunt dated November 19, 1941, Jacques Seligmann Papers, Archives of American Art, Box 75, folder 30. Lent by Pecci-Blunt through Seligmann to The Functions of Color in Painting, Phillips Memorial Gallery, Washington, 1941. See Correspondence between Seligmann and Phillips in Jacques Seligmann Papers, Archives of American Art, Box 130, folder 5 (copies NGA curatorial files). Lent by Pecci-Blunt to Exhibition of Paintings by Corot, Philadelphia Museum of Art, 1946, no. 60. Exposition de l'oeuvre de Corot, Ecole des Beaux-Arts, Paris, 1875, no. 135. Exposition d'oeuvres de Camille J.-B. Corot (1796-1875): Figures et paysages d'Italie au profit de la Bibliothèque d'art et d'archéologie de l'Université de Paris, Galerie Rosenberg, Paris, 1928, no. 44. Exposition Corot, Musée de l'Orangerie, Paris, 1936, no. 92. Probably The Functions of Color in Painting, Phillips Memorial Gallery, Washington, 1941, no. 13. Exhibition of Paintings by Corot, Philadelphia Museum of Art, 1946, no. 60, repro. French Paintings from the Collections of Mr. and Mrs. Paul Mellon and Mrs. Mellon Bruce, National Gallery of Art, Washington, 1966, no. 4, repro. Corot: L'Armoire Secrète, Eine Lesende im Kontext, Sammlung Oskar Reinhart "Am Römerholz", Winterthur, 2011, no. 19, repro. Robaut, Alfred, and Etienne Moreau-Nélaton. L'Oeuvre de Corot. Catalogue raisonné et illustré. 5 vols. Paris, 1905: 3:116-117, no. 1570, repro. Bernheim de Villers, G. C. Corot peintre de figures. Paris, 1930: 68-70, no. 269, repro. Marceau, Henri. "Corot." Art News (May 1946): 32. Eitner, Lorenz. French Paintings of the Nineteenth Century, Part I: Before Impressionism. The Collections of the National Gallery of Art Systematic Catalogue. Washington, D.C., 2000: 75-78, color repro.